Somewhat apropos of the question of whether Mars could be terraformed (which really seems a non-runner due to lack of molten core) the interesting consideration of biodomes was thrown up. By using biodomes an atmosphere (albeit small) could be created, and radiation levels made safe. Is the surface gravity of Mars sufficient to make such structures viable for permanent habitation? Besides the difficulty and expense of creating such structures in the first place, are there other considerations which could make them infeasible as long-term habitats? 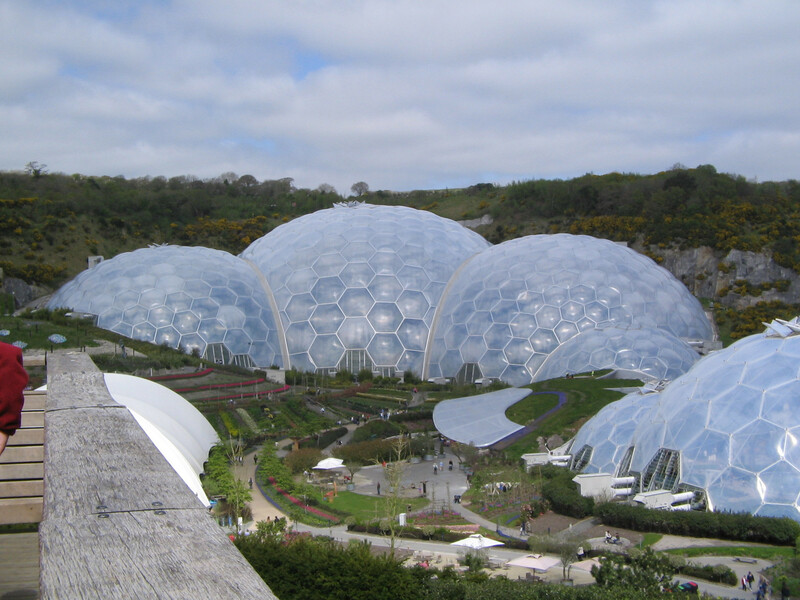 Image of Eden Project included for point of reference. There are no technological barriers, provided one is not too ideological about biospheres. In a comment on the question it is remarked that self-sustaining biodomes have not yet been successful on Earth. This is somewhat besides the point. These exercises on Earth have generally been about creating a self-contained biosphere within a dome, independent of Earth's atmosphere and other resources. In my opinion it's a pipe dream. Being self-contained is unnecessary and more difficult than the task of creating a self-sustaining biodome. When creating a Mars biodome, there is no reason to not mine both the atmosphere and regolith to help sustain the dome. Waste gasses can be vented to the atmosphere, rubbish can be dumped outside, and fresh resources extracted from the atmosphere and regolith. Solar panels can also be placed outside the dome for extra electricity - and possibly wind turbines (which would only work during storms - otherwise the wind speed is too low considering the very low air pressure). The point is, there is little reason to have a closed system on a world bursting with exploitable resources, the important thing is only that the population within the dome is sustained in an environment with a semblance of Earth. I would anticipate that it would be easier to not try and perfectly balance the CO2, Nitrogen and Water cycles within a biosphere using only biological processes, and instead augment the cycles with machinery, using the outside atmosphere as a buffer and to provide a margin of error. 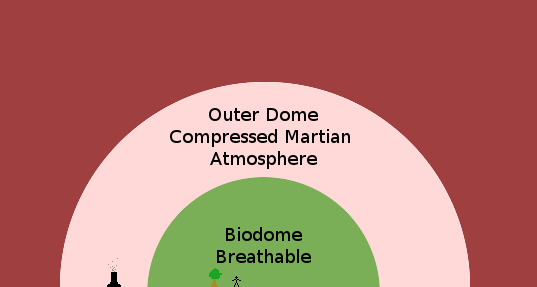 In terms of safety and security, I have thought about domes before, and it would make sense to place a biodome inside an outer dome which is pressurized but inhospitable. The biodome would be filled with breathable air. The outer dome would be filled with compressed martian atmosphere, to a pressure slightly less than that of the inner dome so that the inner dome can support it's own weight, with positive pressure. All things being equal, breathable air mix is expensive. Nitrogen is scarce on Mars - it might improve with regolith mining to extract nitrates, but extracting nitrogen gas from the atmosphere is expensive, also the breathable air mix has to be carefully regulated - probably by machines. Many of the purposes for which we need air other than breathing, can be served equally well by CO2 and the outer dome could be maintained by nothing more than some pressure sensors and an air compressor. It could even be slightly leaky as long as the air compressor can compensate. Providing additional air mass for radiation shielding and insulation (greenhouse effect) - you would want at least 1km of air to help protect against cosmic radiation1. An outer dome could also be made of a layer of water/ice sandwiched between two sheets partitioned like bubble wrap and supported by air pressure 2, which would give supreme radiation protection while still permitting some light through. Mitigating leaks. If the inner dome is punctured, the air inside will only slowly diffuse out into the outer dome, because of the relatively equal pressures. If the outer dome is punctured, the inner dome continues to contain the breathable atmosphere - this also goes for incidental releases of gas such as when opening an airlock to the outside. Providing a more comfortable working environment. Because the pressure in the outer dome is close to that of the inner dome, humans can work and travel within the outer dome with only breathing apparatus, there is no need for a space suit protecting against near-vacuum, cold or radiation. This would provide a convenient zone for industry, staging of machines to be sent outside, and so on. The outer dome can encompass multiple inner domes and structures, with differing requirements. For example, plants present significant atmosphere balancing challenges such as excessive oxygen production. Plants do not require a human breathable atmosphere nor as much radiation protection and separate greenhouse tents could be used for the bulk of agricultural food production, separating the requirements of managing a human-breathable atmosphere, with an atmosphere adequate for plant growth, and isolating dangers such as out of control fires. The above kind of biosphere is heavily machine based, at least at first, probably forever if Earth is any guide, although in time if the nitrogen scarcity is overcome breathable air could be used more extensively and larger enclosed air volumes would provide a more robust buffer against fluctuations in the water/nitrogen/CO2 cycles. Initially a Martian colony would be dependent on Earth for nearly everything. However breathable air, fuel and food can all be created on Mars from local resources using existing technologies. The real and final dependency on Earth would be the machinery enabling this production. Independence from Earth, would not come from creating self-sustaining biospheres on Mars, but instead, when Martian industry can build and repair all the machines responsible for sustaining their biospheres. This might seem like a cop-out on the idea of a biosphere, but really it's not. Just think about how many machines are involved in each morsel of food you eat - from irrigation, combine harvesters, factories, delivery vans to refrigerators and so many more. On Earth we are now utterly dependent on machines to keep the population alive, and on Mars it will be the same only moreso. : See https://en.wikipedia.org/wiki/Radiation_protection#Shielding, 150m of air halves gamma radiation intensity. 1km of air would reduce intensity to less than 1%. : Using the logic in this answer on moon caves 1 atm of pressure, could support 26m of water on Mars, even 2m of water would reduce radiation by 99.96%, and could be supported by an outer dome pressurized to less than 0.1atm. Not the answer you're looking for? Browse other questions tagged mars environment habitat or ask your own question. How can a non-floored habitat be sealed on Mars? Could Curiosity dig itself a burrow? Is a glass habitat on Mars viable? What are the main hurdles to surviving on mars until a return trip? Schedule for self-replication projects for Mars? Could a shuttle be built for Mars?